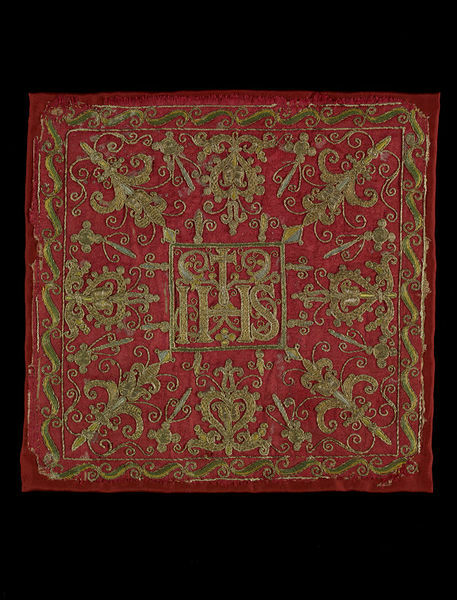 This piece of textile once formed part of a Christian church ornament called a corporal case. The corporal is a white linen cloth on which the consecrated bread (the Host) is placed on the altar during the mass. The case is used to carry the cloth and make sure that it remains pure and clean. Small spots of wax on the surface of the embroidery reveal why a case was necessary protection at a time when candles were used to light the altar. 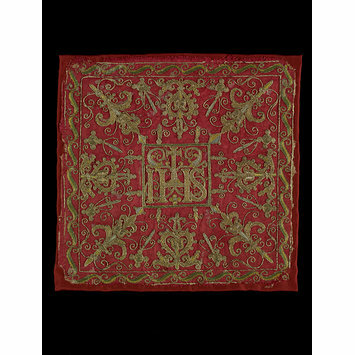 This example is made in red silk (in a satin weave) and is richly embroidered in silver-gilt thread and in coloured silk in a design typical of the period. It is glued to a plain white linen backing to keep it rigid, and was originally sewn to a matching back to create a case. Remnants of the narrow silver-gilt braid that went around the edge of the case are visible on the lower right hand corner. In the centre of the design is the sacred monogram IHS, the Greek letters for Jesus Christ. 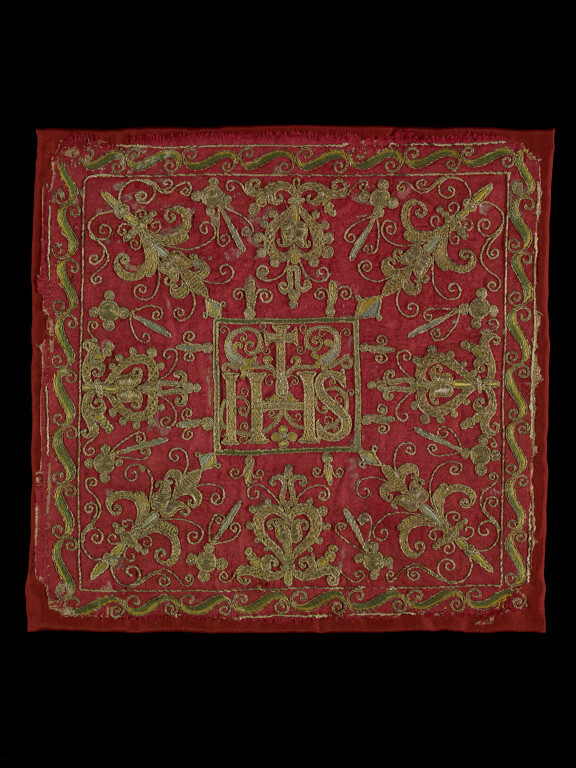 The richness of the embroidery and materials was suitable for this important use, and probably matched the other ornaments or vestments used during the celebration of mass. Front of a square corporal case, made of red silk in a satin weave, embroidered in silver-gilt thread, blue, green and yellow silks, and glued to a backing of white linen in a plain weave. The embroidery is executed to fit the square shape, with two lines of couched thread outlining the outer edge and creating a border in which are embroidered S-shaped scrolls in green and yellow; in the box in the centre (similarly outlined) is the Sacred Monogram IHS (above the cross-bar of the H is a cross on a mound); around this box is a symmetrical pattern of stylised flowers/vases (fleur de lys at the corners? ).Couching, long and short stitch and satin stitch are used; some of the silver-gilt threads are laid over a padding of some description which gives the motif a raised effect. The edges are raw and fraying slightly, suggesting the piece was from its original object; on the lower left edge remains a small fragment of the silver gilt braid that originally surrounded the outermost edge of the case. There are spots of wax on the surface of the silk. A monogram of the name of Jesus Christ; to stand for Iesous Christos or for Jhesus. Provenance: Bought from Mrs Scannell of Kensington, London, in October 1896 for 18 shillings. Historical significance: Significant as a relatively scarce example of surviving ecclesiastical embroidery of this period. A corporal case or burse is the receptacle in which the folded corporal is carried to and from the altar, for convenience and and out of reverence. The corporal is a square white linen cloth, upon which the Sacred Host and chalice are placed during the celebration of Mass and it is important that it is protected from dirt or contamination.The spots of wax on the surface of this piece underline the need to cover up the corporal itself. In Roman form the burse is ordinarily made of two pieces of cardboard about twenty-five centimetres (or ten inches) square, bound together at three edges, leaving the fourth open to receive the corporal. One outer side of the burse is of the same material and colour as the vestments with which it is used; the rest is lined with linen or silk. The use of the burse dates from the 12th century. When the corporal reached small dimensions, it was carried to the altar, sometimes in the missal, sometimes in a special receptacle, a box or bag, which finally took the present form of burse. Just when this custom began cannot be determined. Chronicon vetus rerum Moguntinarum (1140-1251) mentions a precious corporal-case; this may have been, however, only a box for the continual safe-keeping of the corporal. St. Charles Borromeo describes a sacculus corporali distinct from the case in which corporals were preserved (Acta Mediolan, 1683, I, 524). From the fourteenth to the seventeenth centuries the use of the burse spread, and in 1692 it was universally illicit to celebrate Mass without one (Decreta S.R.C, 1866, ad 2m). Attribution note: Most vestments or church ornaments are made to commission although their designs are far from unique.